This post was supposed to be about the amazing brunch I had at Brick and Spoon with my lady friends Megan and Boh. But someone (ME) accidentally deleted those photos from my phone, so....oh darn, now I get to go back! And for now I'll talk about the great Happy Hour experience Megan and I had at Shade a few weeks ago! First off, I made an earth-shattering discovery when I went there. Back when I was a wee undergrad at the University of Miami and was visiting home during spring break one year (it's funny how all the Miami students leave Miami for spring break while all of the other young co-eds seem to flock there), I went to lunch with my mom and her co-worker somewhere in Houston. That was like, 42 years ago, so I clearly forgot where it was. But I remembered exactly what I ate (duh. mussels. pre-mollusk allergy, obvs.) and exactly what it looked like inside (beautiful, light, and airy). Since I've moved back, every time my mom and I go shopping in Rice Village, I point out this one restaurant to her (couldn't tell you the name of it) and say "Mom! That's where you, Gail, and I ate one time when I was in college!" And then she proceeds to look at me like I have five heads, and says, "I have absolutely no idea what you're talking about. And I've never eaten there." This exact conversation has happened about seven times. What is it that they say is the mark of a crazy person? A few weeks ago when I walked into Shade, located on the most adorable street you've ever seen in the Heights, the realization hit me like a ton of bricks: THIS is the place I had lunch at with my mom and Gail! But anyway. Y'all know I love a good Happy Hour. 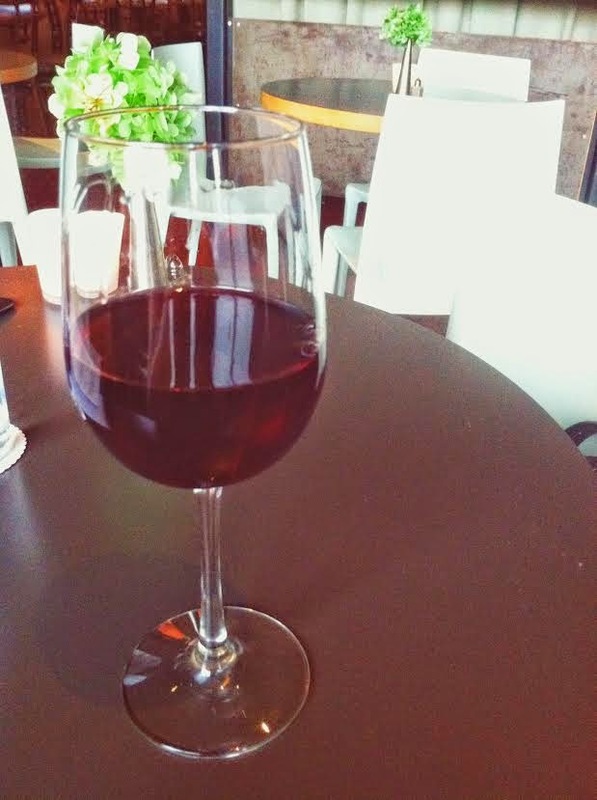 Especially a lovely, super inexpensive Houston Happy Hour that allows you to sample multiple small plates with your friends--and Shade definitely fits the bill here! After much deliberation and hashing it out with our server (these are major life decisions after all), we settled on ordering the Lamb Sliders, Goat Cheese Fritters, and Tempura Fried Broccolini from the Happy Hour menu, along with the Gruyere Macaroni and Cheese appetizer from the Dinner menu. 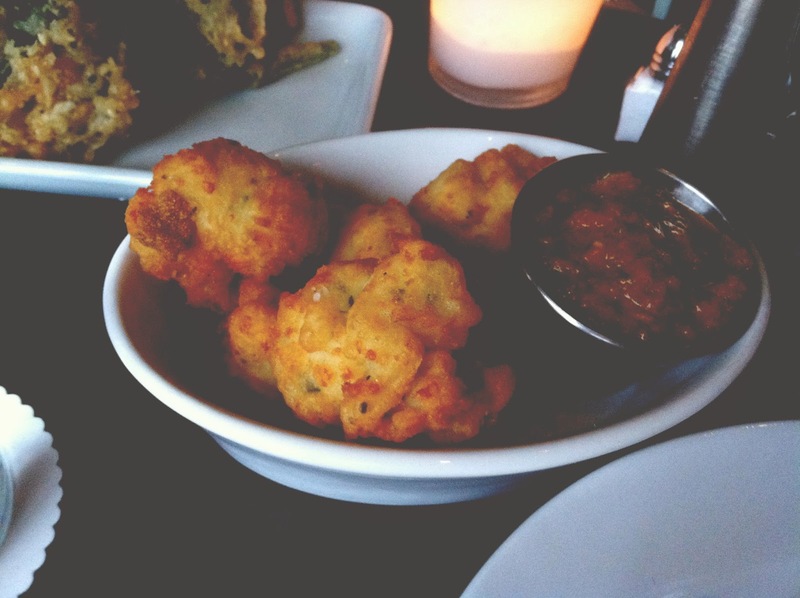 To be perfectly honest, I wasn't blown away by the Goat Cheese Fritters. They were fine, and definitely pretty little suckers, but probably my least favorite thing we ordered. I think it's because the goat cheese was a tad overpowering. When I first took a bite I described them as "fancy mozzarella cheese sticks...but with goat cheese." But I'd probably rather stick to the original. Megan seemed to be more of a fan of them though! 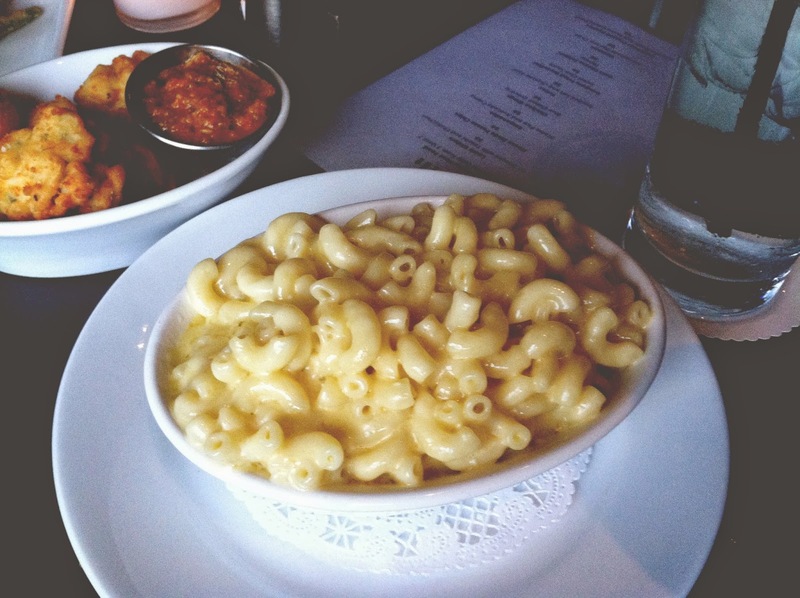 The Gruyere Mac and Cheese, made with truffle oil, is - naturally - super indulgent. Again, not the best truffle mac I've ever had, but it's definitely worth a taste. It's super decadent and filling, and it is something I would have definitely appreciated more during those awful 20 degree spells we got (in Houston! I still can't get over that!) last winter. Okay, now we're getting into the big leagues here. First of all, look at how artfully this plate of Lamb Sliders is done. So many colors! So many levels! 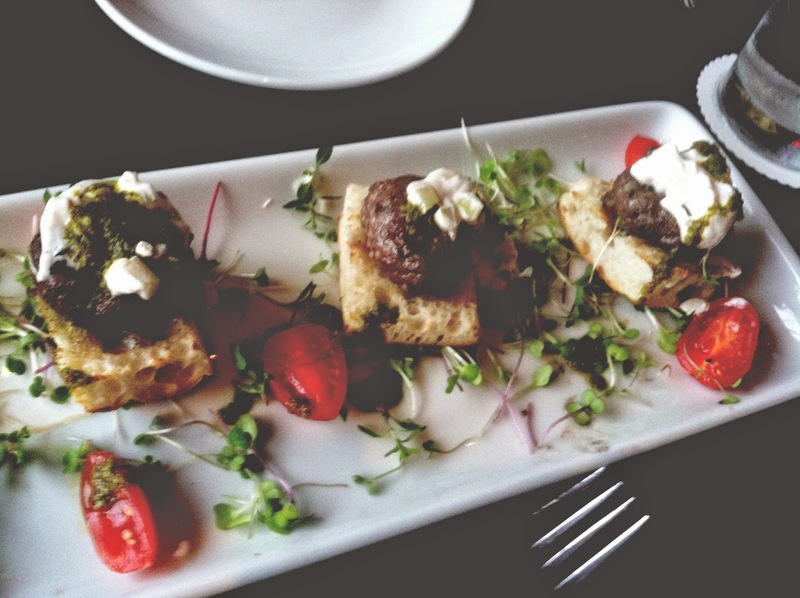 The sliders come on brioche with tzatziki and chimichuri, and they are AWESOME. The lamb was incredibly tender, which contrasted nicely with the firm brioche, and the tzatziki packed a nice little punch. These munchies were gobbled up in no time. Seriously, the next time I go, I think I'll double (oh hell, triple) my order of these! 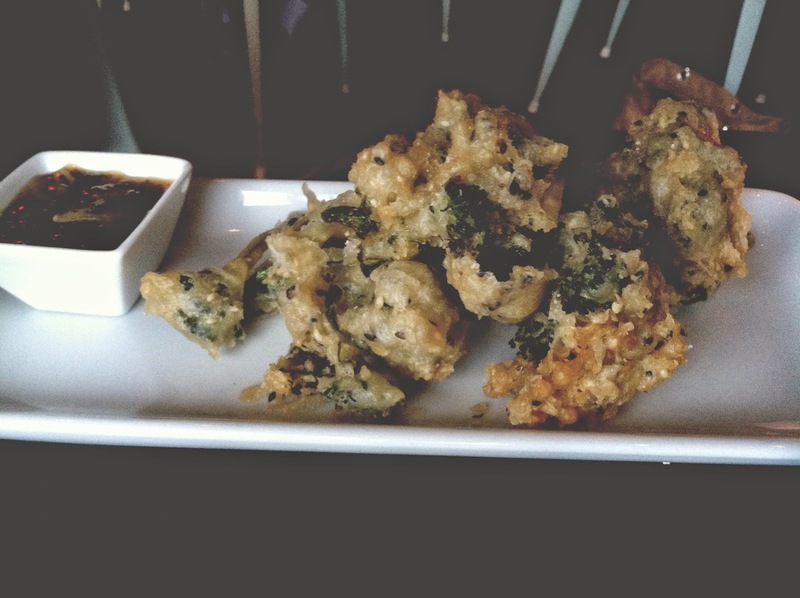 But the surprising winner of our Happy Hour samplings was the Tempura Fried Broccolini! How? Why? Huh? I mean don't get me wrong, I enjoy me some broccoli/broccolini/things of the occoli variety, but this stuff was on a whole new level of wowzers. I don't know how they managed to make the outside so perfectly lightly crisped, while the inside stayed incredibly nice and tender, but it was done beautifully. Also, the sweet chili sauce that came with it? Ugh, so good I died. End result? 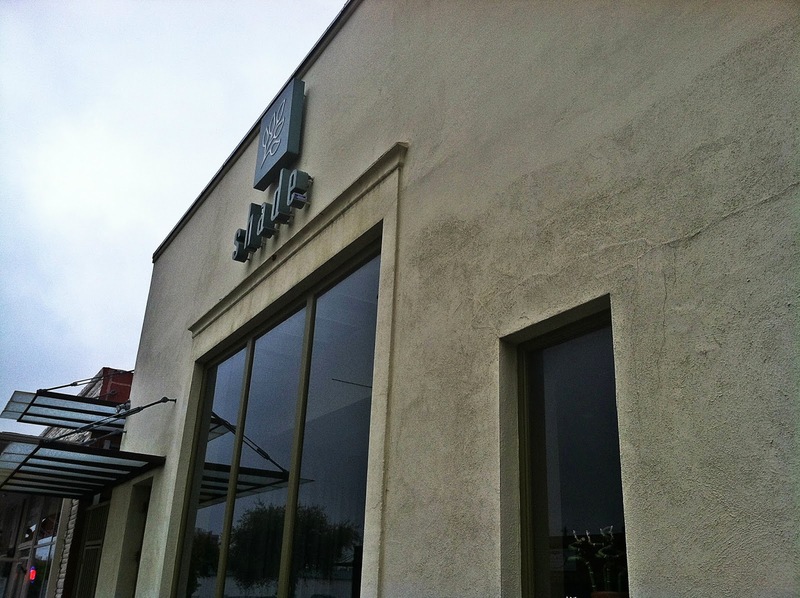 Shade is a darling place with some fantastic Happy Hour food offerings. 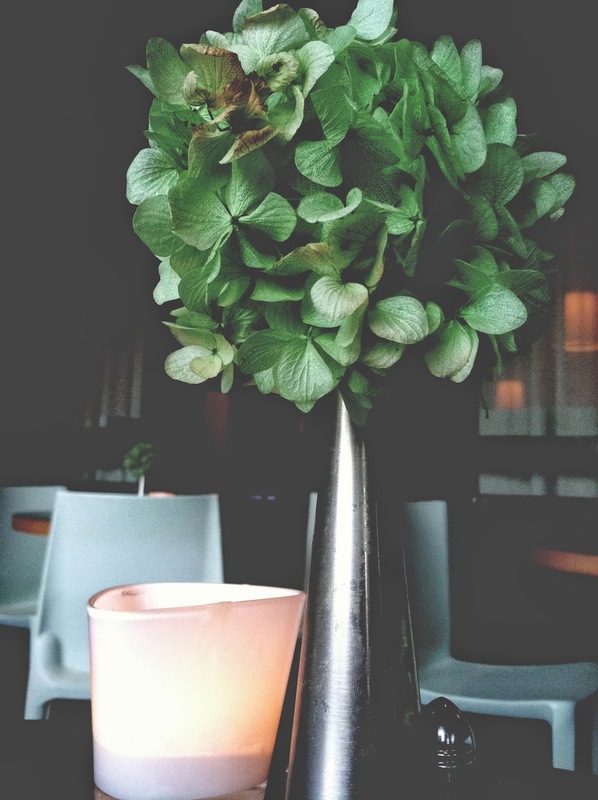 I am happy to be able to recommend another delightful, inexpensive Happy Hour spot in Houston! (But I'm even happier to report that my mother no longer thinks I've *completely* lost my marbles).